BOZEMAN — Where most people see a drop of water splashing in the kitchen sink, a Montana State University professor sees the interplay of chaos and order, a riddle that could one day be solved with powerful computers in order to improve car engines and other technologies. The splashing drop breaks up into smaller droplets, which in turn disperse into even smaller droplets as they interact with air, much the way gasoline vaporizes in a firing engine, according to Mark Owkes, assistant professor of mechanical engineering in the Norm Asbjornson College of Engineering. "Right now, it's assumed physics. Nobody really knows what's happening," Owkes said. Charting an ambitious path for unraveling the mysteries of liquid-gas interactions, Owkes has earned the National Science Foundation's most prestigious award for early career teacher-scholars. The five-year, $500,000 Faculty Early Career Development (CAREER) award, which Owkes won in April, honors outstanding tenure-track scientists, and is notable because it goes to a single person instead of a team. "This really points to the quality of Mark's research and his future potential," said Dan Miller, head of the Department of Mechanical and Industrial Engineering. The research, he added, has broad applications and "could increase the efficiency in a lot of processes that we care about from a sustainability perspective," including vehicle engines, various energy technologies and thermal control of buildings. Owkes describes his research as a hybrid of engineering and computer science that is "math-intensive and (computer) code-intensive." In order to understand how fluids behave in a spray, he creates mathematical models that describe the breakup of liquid into droplets, then runs the simulations on supercomputers such as MSU's Hyalite Research Computing Cluster, which is the largest supercomputer in Montana and an often-used tool at the state's flagship research university. Even these powerful computers can take days or weeks to arrive at an answer. "One of the challenges is that these simulations are massive," Owkes said. Because the research is so time- and resource-intensive, he said, it is relatively inaccessible to engineers trying to design a new fuel injector for a car engine, for example. A major goal of his research is to fix that by making the simulations run faster while also being more accurate, which could help create simpler, more effective modeling tools for engineers, Owkes said. Accomplishing that, Owkes explained, requires new modeling techniques that combine complex mathematics and advances in computer science. One possibility is to develop new computer algorithms that process the large amounts of data in the simulations in order to create something analogous to a family tree for the particles of liquid in a spray. That would create a novel and powerful way to visualize and track the behavior of individual droplets. All this makes it a very interesting time to be working in his research field, said Owkes, who joined the MSU faculty in 2014 after earning his doctorate in mechanical engineering from Cornell University. 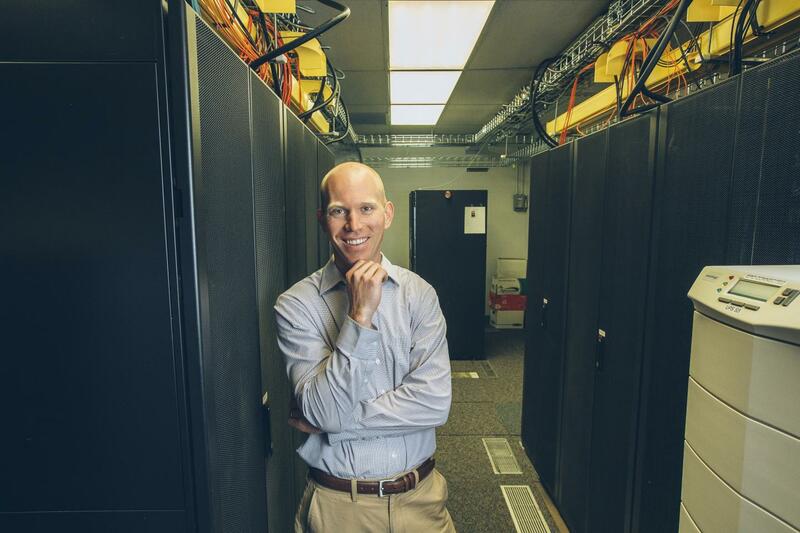 He earned his master's in mechanical engineering from the University of Colorado at Boulder. While earning his bachelor's at Clarkston University in New York, his research was very hands-on, involving wind turbines. "I spent a lot of time in the machine shop," he said. It wasn't until graduate school that he began to merge his mechanical aptitude with computer simulations, which captured his imagination. "You can do experiments with (computer) code that you can't in real life," Owkes said. "Writing code is rewarding. You're creating something very dynamic." By changing just a few lines of computer code, a whole new experiment can be created, he added. That means that computer simulations, as they continue to be improved, will become more and more important throughout engineering, Owkes said. "Mechanical engineers are going to be using computer simulations to design most anything." He wants engineering students at MSU to ride that wave of change and have a working knowledge of computer programming, and to help them do that, some of the CAREER funding will go toward creating a drop-in center where students can get help programming and de-bugging code. The resource will also allow faculty to assign more computer-intensive assignments, Owkes said. The main benefit of the five-year CAREER grant is that it supports an open-ended, ambitious project that emphasizes curiosity and lets the researcher follow the inquiry where it wants to go. "If we talked about this research in five years," Owkes said, "it would probably be very different than what we are talking about today."